The tallest of all of the Eucalypts, Mountain Ash is the common name for Eucalyptus regnans. It grows in the foothills and lowers reaches of mountain areas primarily in Victoria and Tasmania. Valued for its timber, it is also valuable in environmental respects, as a habitat for native fauna, for its ability to sequester carbon and for the water that production that is increased in mature mountain ash forests. 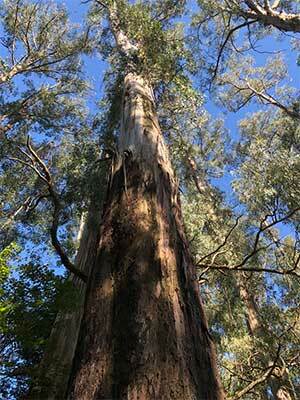 Eucalyptus regnans or Mountain Ash, is also the worlds tallest flowering tree, and when it flowers it attracts bees. The honey produced from mountain ash forests is rare, and also one of the most highly sought after varieties. One of the features of these magnificent trees is the tall straight trunks, characterised by peeling brown bark lower on the tree and smoother cream to grey bark further up the trunk. Mature specimens have an open canopy which allows filtered light through to the forest floor. One of the earliest use of the timber was in the 1850s, when trees were felled in the area now known as Mast Gully Rd, they were used for replacement ship masts. Propagation is easy, usually from seed. Flowers – Small white flowers.